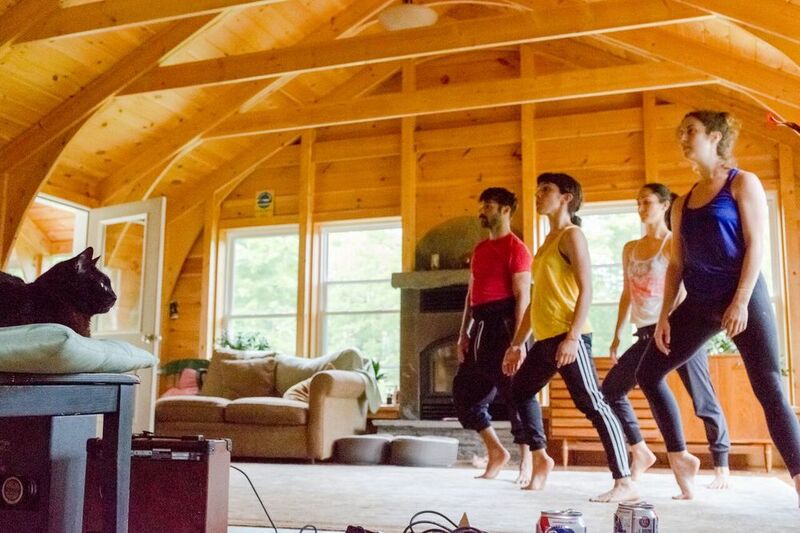 What happens when you open up your home to four dancers, two musicians, one choreographer and a videographer? The House: Rob Saffer built the first LEED certified house in Woodstock, "Byrdland". It rests in an enchanting hollow of Woodstock's Overlook Mountain. 10 years after Rob moved from Brooklyn, where he lived for 25 years working as a creative director and marketing executive for companies MTV, ABC/Disney, and Edelman, he now calls Woodstock his home. He surrounds himself with nature, birds, his cats Dizzy & Bird, and jazz music. Always curious, he lives his life through learning and exploring. The Project: After hours of interviews over the phone, Rob and the CabinFever gang sat down and read the handwritten instruction manual Rob used to build his house. This text became the script for the performance so that the 50 audience members could watch the house build from the group up through music and dance. The rest of the installations were inspired by Rob's love for jazz music, the nooks of the home, the exploration of the hollow, and about his cats "Dizzy" and "Bird".